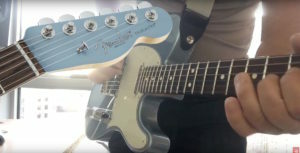 About the Tele: Inspired by the “custom color” instruments of yore, the Limited Edition American Standard Telecaster Matching Headstock sports sophisticated aesthetics for the ages. As simply elegant as ever, the American Standard Telecaster is an enduring design classic for the guitarist who appreciates and aspires to the beautifully bright, clear tone and style of the Fender guitar that started it all. Featuring a pair of American Vintage ’58 pickups for authentic vintage-style tone, this Telecaster rings more fully and brilliantly than ever. Includes a “Limited Edition” neck plate. 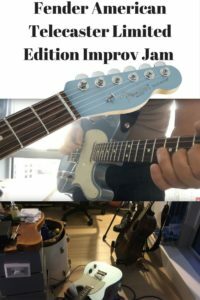 This entry was posted in Behind The Scenes, Improv, Video and tagged fender, tele, video. Bookmark the permalink.